In this section we look at another type of analytical technique; Spectroscopy. Spectroscopy involves the interaction between matter and electromagnetic radiation. There are different kinds of radiation that include visible light, ultraviolet light, infrared, etc., and the type of radiation used determines the type of spectroscopy used as well as what kind of sample can be examined through the technique. Note that features of instrumentation and operation are not part of the VCE study design but are still important to understand the basic principles of each spectroscopic technique. AAS is a relatively sensitive form of spectroscopy when compared to a simple flame test procedure. It is used to determine the amount of a given substance and is capable of detecting over 70 elements. It involves a cathode lamp that emits light of wavelength required to excite the electrons in the sample. The flame is used to vaporise the sample to create an atomic vapour. This step is essential for turning solid samples into gaseous molecules. The monochromator is also used to select the wavelength of light absorbed by the sample to be exposed to the detector and recorder which measures the absorbance of the sample. The amount of substance will determine how much light is absorbed and ultimately how much light is received by the detector. Shells, also known as energy levels, are regions surrounding the nucleus of an atom which electrons inhibit. Electrons that are within shells that are closer to the nucleus experience stronger attraction to the nucleus compared to electrons in further away shells and are thus in lower energy levels. Electrons jump to different shells once excited by radiation and as the electron ‘relaxes’ back down, the electron emits the energy that has been absorbed in the form of light. The emitted energy can be used to work out the difference in energy between shells. The only types of radiation involved in spectroscopy that is capable of electron transitions is UV and visible light radiation. Infrared and radio waves do not have the capacity to promote electrons to higher energy levels. To interpret the results from AAS, a calibration graph needs to be made. 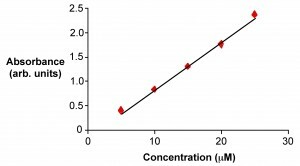 Standard solutions (solutions of known concentration) are tested for their level absorbance and the results are plotted on the calibration curve where absorbance is on the y-axis whereas concentration is plotted on the x-axis. 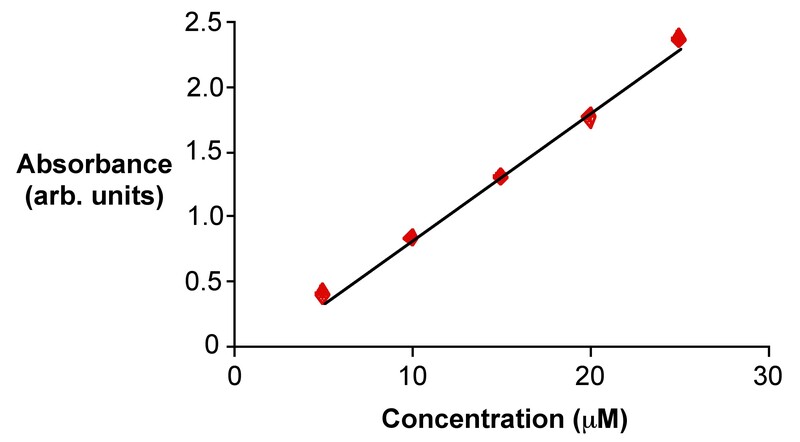 A line of best fit is drawn between all the data points and is used to work out the concentration of the sample from its detected absorbance level. Generally, 4 standard solutions of different volumes are used and plotted on the graph however a minimum of at least 2 standard solutions are required as long as the result of the original sample is in between the two standards. Utilises light from the electromagnetic spectrum that has sufficient energy to be capable of promoting electrons to higher energy states. It is capable of detecting a wider range of elements compared to AAS as it uses not only visible light but also UV. The principles of electron transitions and the use of calibration graphs also apply to UV-visible spectroscopy. The monochromators is an important instrument in this procedure. It is responsible for selecting the wavelength of light that is most strongly absorbed by the sample in solution. For example, if the sample solution was CuSO4, it will exhibit a blue colour. The blue colour that we see in our eyes is due to CuSO4 absorbing all other wavelengths of light other than blue which is reflected off CuSO4; hence the blue appearance. The complementary colour, colour which is on the opposite end of the colour wheel, to blue is yellow-orange and is thus the colour/wavelength of light that CuSO4 can most strongly absorb; hence it is also the colour that is selected for by the monochromators. The light detector and recorder and then responsible for detecting the absorbance of the sample which is then used by comparing the absorbance of other standard solutions to find the samples unknown concentration. Infrared has longer wavelength and is lower in energy than visible and UV light. Hence, infrared does not have enough energy to promote electrons to higher energy states. Instead, absorption of infrared radiation causes molecules to move to higher vibrational energy levels. Each covalent bond absorbs infrared radiation over a characteristic range of frequencies. Examples include a sharp peak found at around 1750cm-1 which is indicative of a carbonyl bond and a broad peak at around 3300cm-1 which is indicative of an alcohol (OH) group. The main purpose of IR is to detect what type of functional groups are present within an unknown molecule. NMR unlike the other forms of spectroscopy utilises radio waves that change and affect the spin of neutrons and protons. Atoms with an odd number of nucleons (protons + neutrons) have an overall spin. Therefore NRM can theoretically be used to study any nuclei with an odd number of nucleons however they need to be present in a reasonable abundance. Hence, the most common types of NMR used are proton NMR and 13C NMR. A reference molecule such as Tetramethylsilane (TMS) is used to standardise measurements across different NMR machines. TMS is used because it is inert and won’t react with the sample and produces a small single absorption peak away from signals produced from other compounds. Signals can also be described as being downfield or upfield relative to one another; downfield referring to signals towards the left of the spectrum and upfield referring to those on the right. ‘Deshielding’ occurs when there is a reduction of electron density around the hydrogen/carbon atom being examined due to electronegative atoms such as oxygen. This in turn affects the amount of energy needed for the nucleus to change spin states. Deshielded results in signals appearing downfield on the spectrum. Number of hydrogen/carbon environments by determining the number of peak sets excluding the reference peak. Chemical Shift; provides information about neighbouring functional groups. The number different peaks at different chemical shifts tell the number of different H/C environments within the molecule. Integration; the area of each peak. The relative area is proportional to the number of hydrogen/carbon in each environment depending on which type of NMR is used. Splitting/Multiplicity; used to determine the number of hydrogen/carbon that is ‘neighbouring’/adjacent to the element responsible for the peak and can also be used to help deduce the connectivity of the molecule. Number of splits = n+1, where n is the number of neighbouring elements. NMR spectrums can be either low or high resolution. Only high resolution spectrums show peak splitting. Involves bombarding the molecule with an electron. I.e. This positively charged molecule is called the parent molecular ion. The mass-to-charge ratio of the parent molecular ion gives the molecules molar mass. The parent molecular ion is unstable and breaks down into a free radical and positive/fragment ions. Since free radicals are unstable as they only have a single unpaired electron, it fragments into smaller fragment ions and uncharged free radicals. Mass spectroscopy picks up the concentration of the fragment ions. The different fragments gives away information about the structure of the molecule. Isotopes are defined as elements that share the same number of protons but a different number of neutrons and thus atomic mass. Examples include carbon-12carbon-13 and chlorine35/chlorine37. It is important to be aware that isotopes exists and they will be reflected as separate peaks that are relatively close together.